#Authtoberfest starts today with Peter Heller interview! 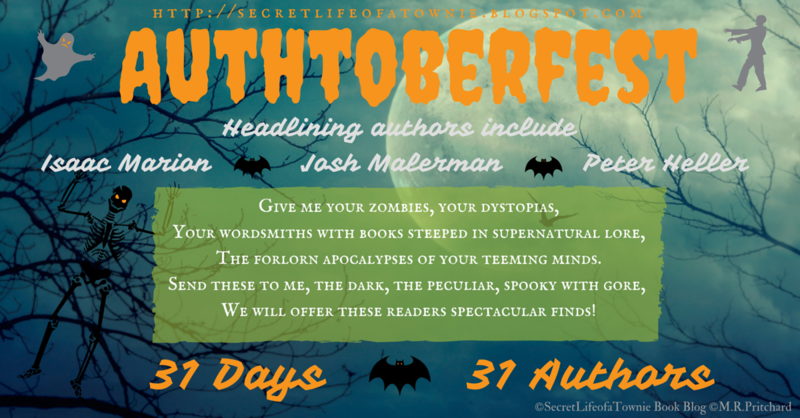 “Authtoberfest” is a month of author interviews from horror, sci-fi & fantasy authors. On my book review blog Secret Life of a Townie. The questions are Halloween and Zombie themed. The authors discuss their favorite books, the ability of their fellow authors to survive the zombie apocalypse, and advice for aspiring writers. With 31 authors there are a lot of great book suggestions and some awesome tips to keep writers motivated. The event starts today with Peter Heller. Peter wrote an amazing novel, The Dog Stars, and has an impressive CV that makes me feel like I’ve done absolutely nothing with my life. He’s a super nice guy who took time out of his busy schedule to answer my emails and impart his words of wisdom upon the world. Isaac Marion’s interview is schedule for October 9th. Isaac wrote the hilarious yet profound novel “Warm Bodies” it was a major motion picture and my favorite read of 2013. My Goodreads review went a little like this: “This started off really fun, really funny, and then turned super deep. So here I sit, book finished, a bottle of wine gone, and I’m still trying to figure out what the f–k I just read…” Isaac had a ton of great tips, book suggestions, and a playlist that gave me nightmares. If you loved “Warm Bodies,” check out his latest release “The New Hunger.” Isaac Marion never disappoints. Peter Cawdron, The Behrg, Ernie Lindsey, R. E. Carr, Nick Cole, and Josh Malerman will also be featured. Josh’s interview brought back all the scary crap from my childhood that I’ve spent the past 30 years forcing myself to forget. I had to sleep with the light on a few times after reading that interview but his thoughts are quite amazing so it was worth it. Josh’s interview posts Oct 31st. “Bird Box” was an amazing read, if you haven’t read it yet make sure you pick it up. I had a wicked ton of fun preparing these interviews for everyone. Check out the author interview schedule or stop by daily. Like, comment, Tweet and share. And have a Happy Authtoberfest! This entry was posted in Uncategorized and tagged #goodread, allhallowseve, am reading, author interview, Authtoberfest, blogging, book reviews, bookworm, goodreads, halloween, mustread, zombieapocalypse, zombies. Bookmark the permalink.